The dynasty was established under the leadership of Simon Thassi, two decades after his brother Judas Maccabeus (יהודה ה��כבי Yehudah HaMakabi) defeated the Seleucid army during the Maccabean Revolt. According to 1 Maccabees, 2 Maccabees, and the first book of The Jewish War by Jewish historian Flavius Josephus (37 CE–c. 100), Antiochus IV moved to assert strict control over the Seleucid satrapy of Coele Syria and Phoenicia after his successful invasion of Ptolemaic Egypt was turned back by the intervention of the Roman Republic. 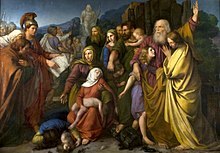 He sacked Jerusalem and its Temple, suppressing Jewish and Samaritan religious and cultural observances, and imposed Hellenistic practices. 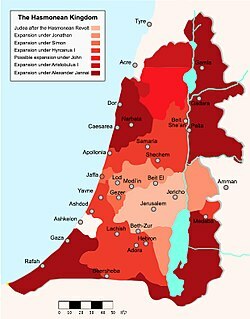 The ensuing revolt by the Jews (167 BCE) began a period of Jewish independence potentiated by the steady collapse of the Seleucid Empire under attacks from the rising powers of the Roman Republic and the Parthian Empire. A Seleucid army under General Nicanor was defeated by Judah (ib. 7:26���50) at the Battle of Adasa, with Nicanor himself killed in action. Next, Bacchides was sent with Alcimus and an army of twenty thousand infantry and two thousand cavalry, and met Judah at the Battle of Elasa (Laisa), where this time it was the Hasmonean commander who was killed. (161/160 BCE). Bacchides now established the Hellenes as rulers in Israel; and upon Judah's death, the persecuted patriots, under Jonathan, brother of Judah, fled beyond the Jordan River.(ib. 9:25–27) They set camp near a morass by the name of Asphar, and remained, after several engagements with the Seleucids, in the swamp in the country east of the Jordan.